On cloud 9 to be called as a design resource for a well-known, well-liked brand with an impactful message and a gorgeous line of products, I signed an agreement with my biggest retainer contract to date. It meant my design would reach a wider audience. It meant collaborating with an amazing team with an established brand and strict visual brand guidelines (my designer heart swelled with happiness). It meant my business would finally provide for my family and alimony would no longer be a necessity, but a cushion. It meant that making summer plans and reserving an Airbnb on the beach was no big deal. It meant that my design would be visible to entrepreneurs on another level – and doors would open. A couple of projects nearly finished, an email notified me that our trial period would end immediately. I lost the biggest client of my career to this point after just a few weeks. Somehow one epic failure brings all the feelings of past (and current) mistakes to the surface. I fail at making my girls a healthy breakfast every morning. I fail to keep my commitment to myself of a daily yoga practice. I fail at keeping the Parent Mindset the Co-Parent’s Handbook suggests and feel resentment at the imbalanced efforts of being Mom. I fail at keeping my emotions out of decision making. I allow my ex-husband’s opinion to get the best of me. I’m failing to write the email sequence for my Dubsado set up, no matter how many times I schedule it in my planner. I fail at playing it cool with the amazing guy I’m into. Most days, I fail at appreciating the sweet, sacred bedtime moments with my girls. I’ve even been failing at writing monthly MotherHustle essays, which mean the world to me. Failing means we’ve taken a risk, and success is never guaranteed. Sometimes, we really mess up and all there is to do is to take an objective view of how to do it differently. Every failure is a new opportunity for course correction. I’ve requested a call with my former client for feedback. My recent encounter with my ex-husband was an emotional reminder that others’ opinions of who I am do not belong in my field of vision. I now have more time to develop my services and work on client experience to strengthen the foundation of my business – while loving on my current clients and showing them my gratitude and appreciation. I proudly call myself a failure, and what I mean is that I am a risk taker. I make my best decisions when aligned with my core values; I embrace the feeling of discomfort from a challenge. These are the steps on the road to success. 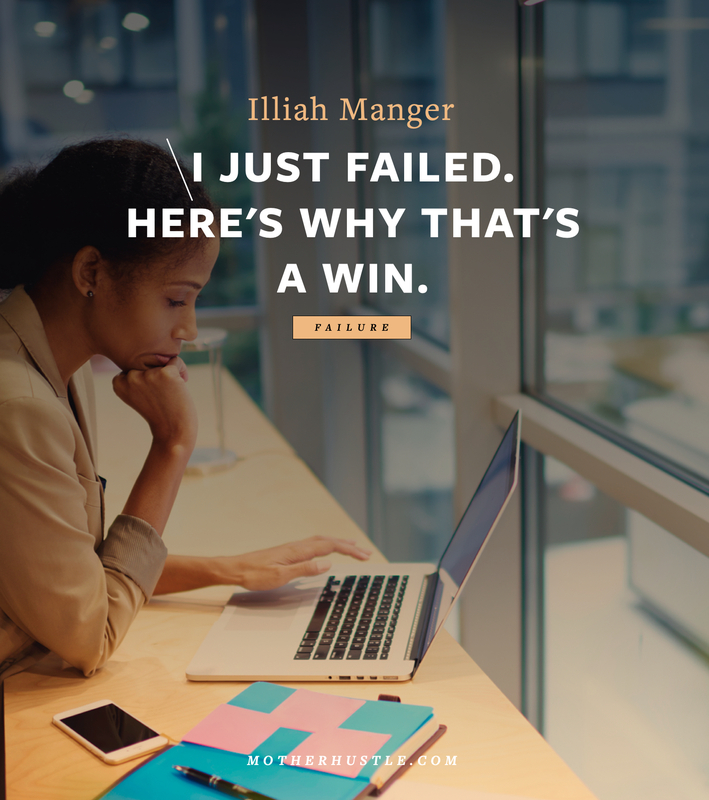 I share my recent failure with you, this sisterhood of mothers doing business and life together, with the hope that you’ll view failing as I do – part of an evolution and the process of becoming the women we want to be. I want us to become more open to not just accepting, but passionately believing that mistakes are a necessary part of growth and our sister next to us is doing her best, too. Then and only then, can we teach our sons and daughters to be bold, silly, confident, independent, smart, brave, and fierce… and to fall gracefully and rise again. Failing opens doors to opportunities never expected. My wedding stationery business failure led me to a profitable branding studio now focusing on rebrand design and the continuation of brand building afterward. Not playing it cool with my guy actually shows him I care. The divorce showed me the importance of prioritizing family. It revealed the gaps where I need to grow. Most important, it provided me with an understanding of self-love and boundaries. I know that I would much rather wake up early with my girls – my mind turns off after 7 pm most days. It’s a reminder to give myself grace when I’m worn out after a long day; A lesson to take bedtime slowly and enjoy the sweet moments that mean so much to my girlies. My ‘mama’ time will soon follow. And here I am, writing to you, my first MotherHustle essay of 2019. What’s Left When Dreams Are Destroyed?